October 31st is Halloween, a great day of celebration, especially for the kids. The origin of Halloween can apparently be found in the traditions of the Irish and Scottish who celebrated the end of the summer that day. Today, what do you think about when you hear ‘Halloween’? Little monsters coming to your house? Candy? I’m sure you also think of pumpkin. Now, you are probably also thinking of spicy pumpkin pie and other delicious pumpkin treats. The good news is that pumpkin is rich in nutrition, filled with vitamins, minerals and antioxidants. Did you know that pumpkin is one of the richest sources of Vitamin A, which is a powerful antioxidant and helps you to maintain a healthy youthful skin? And don’t forget about Vitamin C & E – both of which help boost your immune system and nourish your body. Pumpkin’s rich orange color provides a clue to its other health benefits such as Beta Carotene. Beta Carotene is a type of polyphenolic flavonoid that converts to vitamin A within the body. Another health boosting compound is zeaxanthin which has a particular benefit for your eyes. Zeaxanthin helps to support filtering UV light in the retina of the eyes. This in turn helps to protect your eyes from age-related macular disease, a disease many people unfortunately experience as they get older. The goodness of pumpkin doesn’t stop there because it also contains essential minerals such as potassium, phosphorous calcium and copper. And if this is not enough, pumpkin is also filled with a rich variety of Vitamin B compounds too, in particular vitamin B6, niacin, thiamine, and pantothenic acid as well as folates – all of which are building blocks of good health and nutrition and a more youthful appearance. 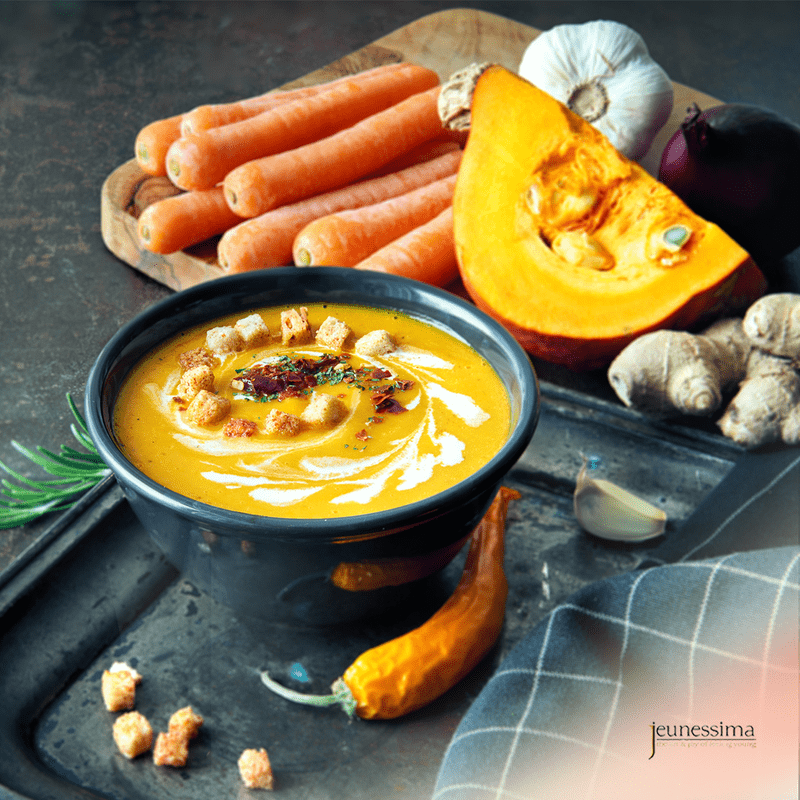 The great thing about pumpkin though is that it is not just good for you, but as a food it is really versatile too. You can prepare and eat it in so many ways that it is not surprising that entire recipe books are devoted to the wonderful pumpkin. Some creative craftsman have even produced tasty beer in the form of pumpkin ale. Now I am not suggesting you start your own home brewery, but there are some other fantastic ways you can enjoy all the nutritional goodness in your home. Here we are sharing a ‘couldn’t be easier’ soup recipe so that, as you ease into the colder months of the year, you have a delicious quick recipe on hand that is good for you, and tasty too! Cut the pumpkin into slices, about 2 fingers wide. Peel off the skin and remove the seeds. Place the pumpkin, onion, garlic, broth and water in a pot. The liquid will not cover all but don't worry! Bring to the boil, uncovered, then reduce heat and simmer until the pumpkin is tender. Use a stick blender and blend until smooth. If you don't have a stick blender, carefully transfer the soup to a food processor and blend. Season to taste and stir through the cream. Ladle into bowls before garnishing with a drizzle of cream and some pepper. 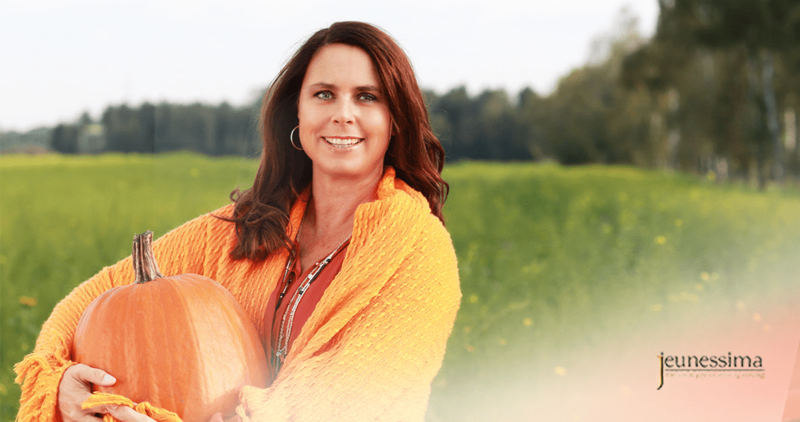 We'd love to hear what your favorite Fall recipes are!